Faucet snails are small animals with coiled spiral shells. They grow up to a half inch long and are longer than they are wide. They are light brown to black, with four to five coils (whorls) in the shell. The shell opening is on the right when the shell is pointed up. They have an operculum (”trapdoor”) that covers the opening, with concentric rings that resemble a bullseye. The operculum may be missing when the snail is dead and the shell is empty. Faucet snails can be difficult for non-specialists to conclusively identify. The faucet snail grazes and filters algae from the lake. Populations contain both males and females. Females can produce about 300 eggs which they lay on rocks, wood, and shells. Eggs hatch in three weeks to three months, depending on water temperature. Their lifespan is one to three years. The snail is an intermediate host for three intestinal trematodes, or flukes, that cause mortality in ducks and coots. The faucet snail is native to Europe. The species was unintentionally introduced into the United States’ Great Lakes through contaminated solid ballast of large timber transport ships, or with vegetation used in packing crates. It was first recorded in the Great Lakes in the 1870s and the first inland population in Minnesota was confirmed in Lake Winibigoshish in 2008. Refer to EDDMapS Midwest for current distribution. They can look similar to many native snail species found in Minnesota. There are a number of snail species native to Minnesota. Contact the DNR for more information on native snails. The faucet snail (Bithynia tentaculata) is a prohibited invasive species, which means it is unlawful (a misdemeanor) to possess, import, purchase, transport, or introduce this species except under a permit for disposal, control, research, or education. The snail is an intermediate host for three intestinal trematodes, or flukes, (Sphaeridiotrema globulus, Cyathocotyle bushiensis, Leyogonimus polyoon) that causes mortality in ducks and coots. When waterfowl consume the infested snails, the adult trematodes attack the internal organs and cause lesions and hemorrhage. The trematodes contributed to the deaths of about 9,000 scaup and coots in 2007 and 2008 on Lake Winnibigoshish. 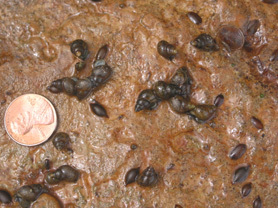 There is no evidence that wildlife besides waterfowl are adversely affected by the trematodes present in faucet snails. Anglers can eat fish from faucet snail infested waters without worry of the parasite. Compete with native snails for food and habitat. May clog water intake pipes and other submerged equipment. People spread faucet snails primarily through the movement of water-related equipment. They can attach to boats, docks, swim rafts and boat lifts. Adults and young, which may be hidden in mud and debris, can stick to anchors and ropes as well as scuba, fishing and hunting gear. Their operculum allows them to close their shell and survive out of water for multiple days. It is recommended that hunters and stream anglers scrub their waders with a stiff brush to remove debris and avoid the use of felt-soled waders, since the felt can easily trap, and thus potentially transport, invasive species. Report new occurrences of faucet snails to the DNR immediately by contacting your DNR Invasive Species Specialist or log in and submit a report through EDDMapS Midwest. There is no known effective population control for faucet snails in natural water bodies at this time.